It’s not everyday you see an auditorium full of adults waving their arms in the air, singing a behaviour-improvement rhyme to the tune of ‘Twinkle Twinkle Little Star’. That’s what happened last Friday when more than 150 people converged on CDU’s Casuarina campus to hear about groundbreaking research and programs being conducted at the School for Social and Policy Research (SSPR). 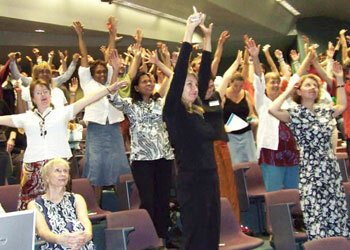 The audience participation was prompted by staff of the Let’s Start intervention program for young children and their carers (www.cdu.edu.au/letsstart), during a session which explored issues in childhood interventions. It was one of three sessions run by SSPR staff to showcase the work of the School. The forum was declared a resounding success by the School’s founding director, Associate Professor Tess Lea. ‘Just four years ago the School for Social and Policy Research was nothing more than an idea. Now we have rigorous research programs of national significance,’ she said. In addition to the presentations, the foyer of CDU’s Mal Nairn Auditorium was a sea of colours with banners, balloons and posters, where guests from business, industry, and government were able to find out more information on the School’s projects and mingle with researchers, PhD candidates, and staff. Other features of the program included a session exploring current developments in the National Accelerated Literacy Program (www.nalp.edu.au). Co-creator of the program, Wendy Cowey outlined how the program overcame cultural barriers in NT classrooms. With improved literacy, she said, students’ fear of failure was greatly reduced. The final session combined research on the Territory’s mobile population, urban planning and gambling research. Dr Tom Wilson outlined key findings from the Northern Territory Mobility Survey, while Dr Martin Young discussed the future direction of gambling research in the Territory. The program and presentations can be downloaded at www.cdu.edu.au/sspr.